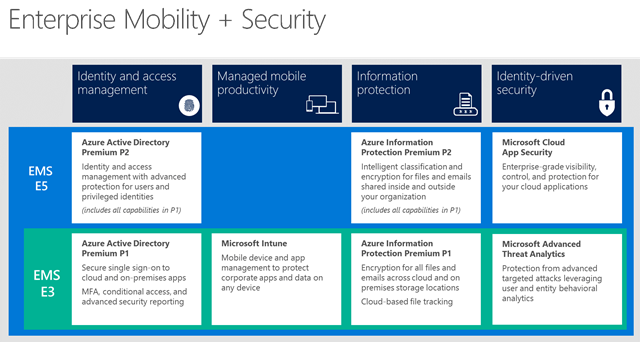 Microsoft’s Enterprise Mobility and Security, also known as EMS, is suite of tools that provide extra control over your company’s data. There are two versions for the enterprise: E3 and E5. This blog article will dig a little bit into the differences between them. Microsoft EMS E3 is the “original” version of EMS. It includes The “P1” versions of Azure Active Directory and Azure Information Protection. It also includes Microsoft Intune and Microsoft Advanced Threat Analytics. Essentially, Microsoft EMS E3 contains the “base” version of the 4 products included in EMS. You now get the “P2” Version of Azure Active Directory. It contains “new Identity Protection and Privileged Identity Management” capabilities. These new functions help protect against identity theft, and provide additional usage data on admin actions. You now get the “P2” Version of Azure Information Protection. It adds automatic classification to your feature list. This means documents can be automatically encrypted, rather than the only available “manual” encryption method in P1. Microsoft’s new Cloud App Security – this can help you discover the cloud apps in use in your network, and control access to those apps. (For instance, it will inform you of which 3rd party services an employee may be using without authorization). EMS E3 or E5: Which One is Right For You? Do you want Azure Active Directory to provide you with extra data regarding potential identity theft in your organization? Do you want Azure Active Directory to provide you with extra data regarding the actions that administrators take in your account? Do you want Azure Information Protection to automatically encrypt your files? Otherwise, your protection settings can only be added manually. Do you want control over the external cloud applications that your employees use? If you answered “yes” to any of the questions above – and having this capability is worth an extra $6/user/month – consider EMS E5. Also keep in mind that there are over 27,000 enterprise EMS customers, and virtually all of them are on E3 at the time of this post. That is because E5 is a new product, only just introduced by Microsoft. EMS E3 is not an “inferior” product by any stretch of the imagination. Finally, the version of EMS that you choose has nothing to do with the Office 365 Version that you choose. That is a question we’ve come across once or twice. If your business experiences these red flags, your diagnosis is clear: time to adopt the cloud! Trevor provides insight on how technologies like Microsoft Dynamics, Azure, and Office 365 can help improve the way organizations operate.